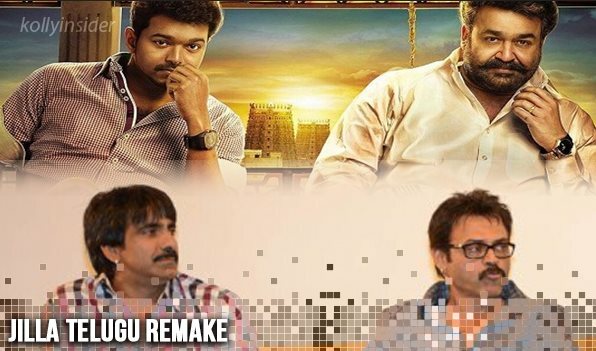 If sources are to be believed, actors Daggubati Venkatesh and Ravi Teja are likely to team up for the Telugu remake of last year's Tamil blockbuster "Jilla", which featured Mohanlal and Vijay in the lead roles. "The remake idea was discussed with another popular hero, but he was not happy with the story. So eventually the idea had to be dropped. Now, Venkatesh and Ravi Teja have been approached for the same project and they've expressed interest to be part of it," a source told. The remake rights have been acquired by actor Pawan Kalyan's close friend Sharat Marar, who had produced "Gopala Gopala", a remake of Hindi film "OMG: Oh My God", featuring Venkatesh in one of the leads. "It was post the release of 'Gopala Gopala', the remake idea was discussed with Venkatesh. He liked it and also didn't show any qualms of teaming up with Ravi," he said. Director Veeru Potla is likely to direct the project, which is expected to go on floors from April.